A very serious; virtually unmatched product for those who need optimum accuracy and power on target. 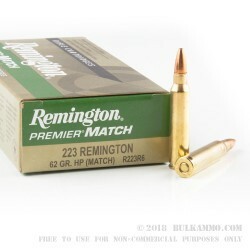 This is both a premium match load and a premium hunting load for larger game that can still be serviced by the .223 Remington caliber. 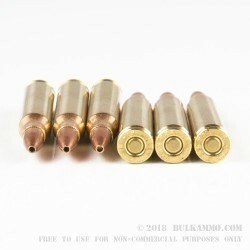 Note: some jurisdictions do not allow larger game to be taken with lead core ammunition, or with ammunition of this caliber, you are advised to check state and local regulations before using this on a hunt for larger game species. The heavy weight projectile offers significant power on impact against larger game up to about 400 lbs., where allowed. 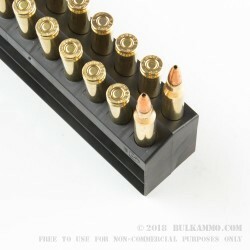 The accuracy is capable of sub minute of angle in most bolt action rifles from factory and capable of far better accuracy when paired with a high precision match style firearm. The accuracy of this round is hard to match. The larger grain weight works best with the tighter twist rates 1:7 (one twist in 7 inches) is an obvious choice so that proper spin stabilization is possible out of the bore. This round is best used from 100-350 yards, but is suitable beyond that point, or for shorter distances, depending on your overall conditions or setup. 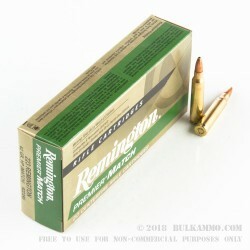 The intermediate distances here showcase the unique benefits of running a highly accurate 62 grain hollow point out of the gun.